The sound-blocking feature is planned for a gradual rollout, so many users may not see it for a while yet. For those who do, look out for a new icon appearing in the increasingly cluttered Site Information section of the Address bar. Clicking this reveals a new 'Autoplay sound' feature, which can be toggled on or off for that specific site. 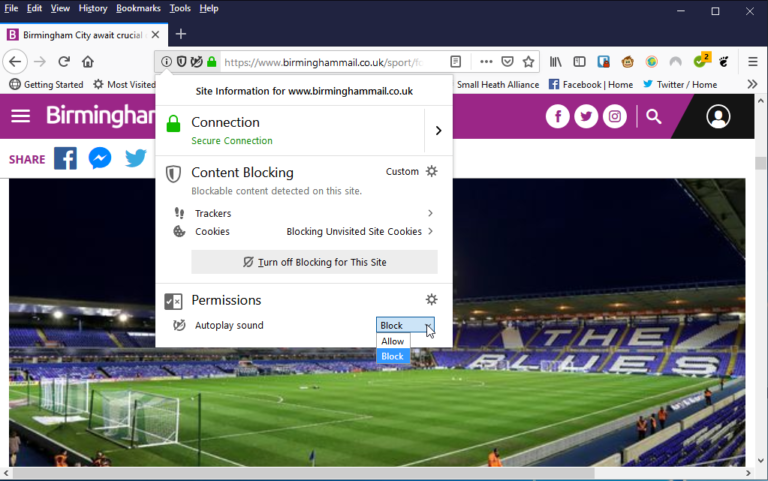 The feature can be enabled/disabled at the user’s discretion via Options > Privacy & Security under Permissions -- click untick 'Block websites from automatically playing' to disable it. Click the Exceptions… button to whitelist individual sites and edit existing preferences. Elsewhere Firefox 66 unveils an improved search experience, with a new 'Search Tabs' option (found on the tabs overflow menu under the ˅ button. The new Private Window tab has also been redesigned to provide users with the ability to easily search using their default search engine. A new scroll anchor has been introduced to eliminate the annoying jumping of content as images and ads load further up the page. Extensions now store their settings in a central Firefox database rather than individual JSON files, which should speed up website browsing. Users also benefit from more easily being able to assign keyboard shortcuts to specific extensions via the about:addons panel (click the tools icon and choose 'Manage Extension Shortcuts'). Certificate error pages have been redesigned to provide more information and help resolve issues. Platform-specific changes include basic support for Touch Bar on supported MacBooks. Windows 10 users gain support for Windows Hello, allowing face, fingerprint or external security keys to authenticate websites. Fixes include one that resolves freezing issues when downloading files on Firefox for Linux. The Dark and Light Firefox themes now override system settings in Windows 10 too. Android users gain the sound-blocking feature and scroll anchoring support, plus users can now open files from external SD cards and other storage. Firefox Quantum 66.0 and Firefox for Android 66.0 are both available now as a free, open-source download for supported versions of Windows, Mac, Linux and Android.